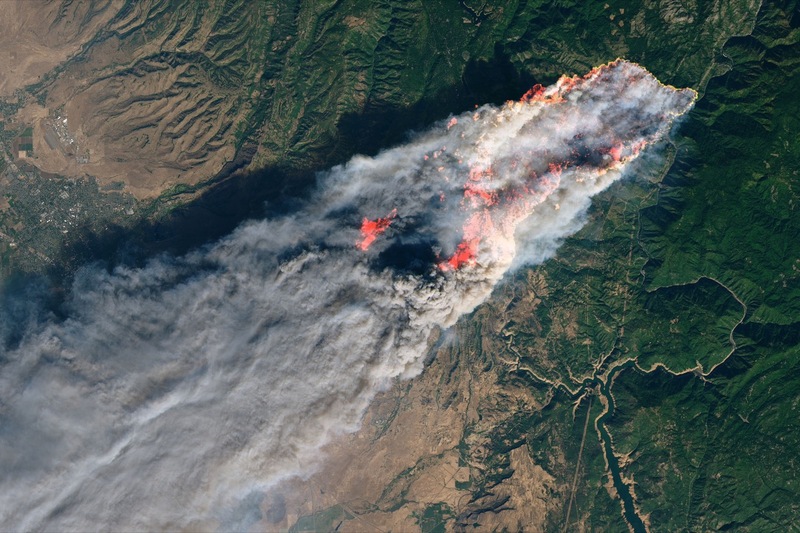 When wildfires strike, the conversation typically centers around natural factors: forest management, climate change, or hot dry winds that fan the flames. But there’s another important factor in wildfire risk: what humans build. Not just where we build, adjacent to flammable landscapes. But how we build it. Fire historian Stephen Pyne joins us to talk about what we might learn from the way we build in big city centers, where we’ve been largely successful at stamping out big blazes. Plus, Southern California Edison admitted that its electrical equipment may have been at least partly to blame for sparking last year’s deadly Thomas Fire in southern California. And Pacific Gas and Electric’s stock took a beating when news spread that one of their high voltage power lines had an issue right around the time the Camp Fire began to burn. The cause of that fire is still under review. But California fire officials already know power lines and electrical failures are one major cause of the state’s wildfires. Sascha von Meier of UC Berkeley tells us a few ways power companies might fortify the grid to avoid sparking fires. 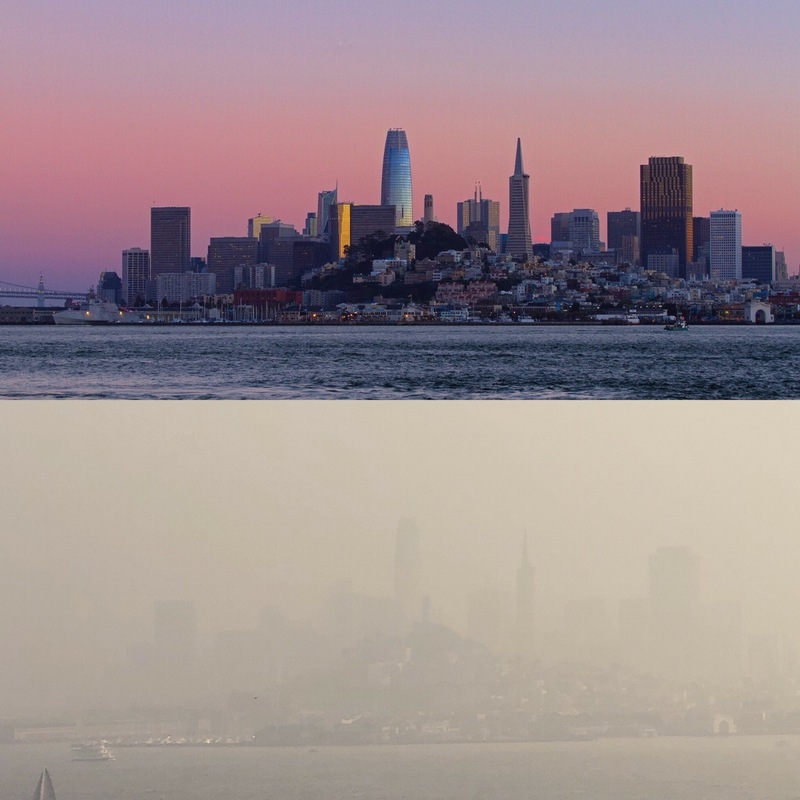 Meanwhile, Science Friday’s Executive Director, Danielle Dana, shared comparison photos of the smoke from the Camp Fire in San Francisco. Steve Pyne is a fire historian at Arizona State University in Tempe, Arizona. Alexandra von Meier is the director of Electric Grid Research at the California Institute for Energy and Environment. She’s also an adjunct professor in the department of electrical engineering and computer science at the University of California, Berkeley. IRA FLATOW: This is Science Friday. I’m Ira Flatow coming to you from WUSF in Tampa, and we have started talking this hour about the wildfires in California. And when wildfires strike, a lot of the conversation typically centers around natural factors, like how the forests or scrub have been managed or left alone, climate change, drying out the landscape, or hot winds fanning the flames. But there’s another important factor here, and that is what humans build. Not just where we build adjacent to flammable landscapes, but how we build. And my next guest says we might learn a thing or two from the way we build in big city centers to stamp out fire risk. Our questions for listeners today– if you live in an area with high fire risk, have you retrofitted your house to make it fire safe? And if you were affected by the recent wildfires, we want to hear from you too. 844-724-8255, 844-SCI-TALK, you can tweet us @scifri. Let me introduce my first guest. Stephen Pyne is a fire historian and professor in the School of Life Sciences at Arizona State University. He is author of the Book Between Two Fires, and as well as many others. Welcome back to Science Friday. IRA FLATOW: You’ve said that we need to think of our wildfires like an urban fire problem. What do you mean by that? STEPHEN PYNE: Well, the wildland-urban interfaces is a kind of geeky term, but it was invented by the wildland side of the community which saw their problem being complicated by encroaching houses, urban sprawl, and so forth. But we could just as easily define that problem from the other side of the border and consider– these are really urban fires with funny landscaping. And if you think about it in those terms, I mean, these are really fragments of cities, they’re exurbs. They are little bits of built environment. And in the past, our cities used to burn as frequently as the countryside– they were made of the same materials, responded to the same droughts and winds. And we finally fixed that. We were able to disentangle those two. And then on the urban side we began getting serious about codes, materials, zoning, putting in an appropriate infrastructure and so forth. And these fires went away. And now they’re coming back– it’s like watching an old plague return. We thought we had fixed that. But my comment was actually that maybe we were still defining it as strictly a problem on the wildland side. If we think about the analogies as to the urban side, and we think about the history– how did we squeeze fire out of our cities, which were so combustible, that maybe that’s the model we should be looking at. IRA FLATOW: Are you saying then our houses are just too vulnerable now like they used to be? And we should do something to make them less of fire-risky? STEPHEN PYNE: Sure. Well there are lots of things, and part of it is that the fire equation has changed as well. So you sort of think you’ve got houses that are appropriate or adequate enough for the conditions. The conditions changed, now we’re seeing fires that are a little more savage, a little faster, more problematic. Maybe we need to re-examine the codes. But there’s quite a lot of evidence, though, that the home ignition zone, as it’s called, the structure and its immediate surroundings– I mean immediate within matters of feet or yards– is really where you want to put most of your effort. Fires are going to happen in many places, they need to happen– the real payoff comes from hardening the houses and explicitly– certainly getting rid of combustible roofs. I mean, that should have been solved many, many years ago. But just the kind of vegetation you have right adjacent to your house, the materials of the house, most of these houses are taken out by embers, and the embers may take a while to burn, so the houses actually combust very frequently after the main fire front has passed. So you’ve got thousands– tens of thousands of sparks, this blizzard of sparks blowing through. If there’s is a point of vulnerability, one of them’s going to find it. IRA FLATOW: You speak from experience. You had a house in the wilderness that nearly got incinerated by a fire? IRA FLATOW: Avoided it? Why was your house spared? STEPHEN PYNE: Well, I spent 20 years imagining what kind of fire hazard we would face, and I said, it’s going to be a spring fire, it’s going to come very fast, it’s going to be wind-driven, it’s going to come over those hills to the southwest of us, it’s going to drop a million sparks down, and those sparks are going to ignite. The wind’s going to be a little calmer at that level. How does this landscape look to fire? And what do we need to do? We’re not going to nuke this place, we’re not going to pave it, we’re not going to take out every piece of vegetation, but how do we have a place that looks attractive, it’s bio-friendly, but it is also relatively fire-safe? We did that, and I have to say, the vegetation around– a lot of the stuff we were cultivating to grow up well away from the house was all incinerated. Our massive woodpile laboriously assembled was all fried down to ash, but the house came through without a scorch mark. So part of that is luck, but part of that was preparation, it is possible. IRA FLATOW: That’s interesting. Let’s say you’re the governor now. You’re Governor Brown or you’re Governor Pyne of California, and your top priority is solving this problem. Tell me what your top priority is to do. STEPHEN PYNE: Wow, great question and a tough one, I’m glad I’m not governor. IRA FLATOW: [LAUGHS] Because this must be a huge political problem, right? STEPHEN PYNE: Right. Well, there are bunches of things. I think one of the first things is to make sure that the fire problem does not get hijacked by other agendas. Fire is so graphic. Fires like what we’re seeing are so horrific that they galvanize lots of sentiment. And people will try to rally that sentiment towards some other cause. Let’s make sure we open it up to logging. Let’s make sure climate change is the only thing that matters– whatever. First of all, make sure that you’re focusing on stuff that actually address the fire problem. And then I would begin– I would give Cal Fire, a more explicit charter to do what they’re doing. Everybody admires what Cal Fire does, but everybody, including Cal Fire, admits, this isn’t the solution. More air tankers, more engines is not going to solve it. They sort of know a lot of things that we can do, even a lot of small things– give them an explicit political charter. Cover their back on this and tell them, OK, do it. And the third thing– OK, cost, it’s going to cost a lot, but it’s not just money. I think what has really stymied a lot of it is the social costs. Having to get consensus, getting people to agree on things, getting people to admit there’s a problem, getting them to admit that fire is a contagion phenomenon. If you treat your house and your neighbor doesn’t, your house is going to go. May very well go. And we’ve seen some examples recently in Australia where people at great expense retrofitted their houses, their neighbors didn’t, and all the houses went when the fire came. STEPHEN PYNE: –is a social problem. IRA FLATOW: Now I want to get a caller who has that experience. Kit from McCulloh, California, which is 100 miles from Paradise, welcome to Science Friday. SPEAKER 1: Well thank you. We enjoy your show immensely. IRA FLATOW: Thank you. Tell us about your experience. SPEAKER 1: So we live in an oak woodland in the foothills, Sierra foothills, and we have through– we’ve been here over 40 years. And so as we’ve re-sided and re-roofed, we changed from wood shingle roofing to baltic shingles, and then when we re-sided the house, it used to be Redwood siding, we went to a cementitous siding that looks like wood, but it is absolutely fireproof. And in addition, we cleared about 200 feet down the hill out of oak trees and other brush that is highly flammable. IRA FLATOW: Good for you. Thanks for calling, yeah. You did it. Yeah, she did what you were talking about basically. STEPHEN PYNE: Yeah, it’s not that difficult. I mean, it can be costly and time-consuming. Again, you’ve got to get– in many ways, it’s like vaccinating. You’ve got to make sure that almost everyone does it. And at that point, it also was a political issue– legitimately political. I mean, we’re talking about public safety and often public lands and assets. The political system has got to function to bring together the rest of it. IRA FLATOW: I’d like to turn now to one of the causes– possible causes of these fires. Southern California Edison admitted that its electrical equipment may have been at least partly to blame for sparking last year’s deadly Thomas fire in Southern California, and Pacific Gas and Electric’s stock just took a beating when news spread that one of their high voltage power lines had an issue right around the time the Camp fire began to burn, and the cause of that fire is still under review. Can we fortify the grid to avoid sparking fires? Sascha von Meier is Director of Electric Grid Research at the Cal Institute for Energy and Environment at UC Berkeley, welcome to Science Friday. SASCHA VON MEIER: Thanks, Ira. IRA FLATOW: Well, apart from the usual things– clearing trees, vegetation, we’ve heard about this, there’s been talk about burying cables. Is that a feasible thing we could do? SASCHA VON MEIER: That’s more expensive than you might think. I mean, you can start with insulating conductors, but keep in mind that we rely on cooling conductors with the wind in the air. So wrapping them in an insulating jacket means that we can put less current through them or we have to make them fatter, which also makes them heavier. Burying them underground typically is something we do for distribution systems where you might go a few miles, not so much for transmission lines where you go tens or even hundreds of miles. IRA FLATOW: Yeah. What other techie solutions might power companies have to avoid sparking fires? Sensors on the line? Letting us know when there’s a problem, something like that? SASCHA VON MEIER: Exactly. That’s one approach that we’ve been working on at Berkeley is to get better information and sensing of the electrical conditions. And we can do this with high resolution synchronized measurements. That means that we’re not just getting data once every few seconds or minutes, but actually many times per second, that we can observe very small disturbances. And small faults, like the kinds of arc faults that actually are very common but go unobserved, whether it’s a [INAUDIBLE], a tree branch touching a line. In distribution systems we often have animals that make contact. There are little arcs all the time, and being able to see those events and then go in with advanced machine learning algorithms, for example, if we have a fast database that can look for these events and we can begin to anticipate what might be precursors to larger faults that could spark a fire. IRA FLATOW: And let’s talk, Stephen, about renewable energy. It’s growing in California and other places. Is that going to help? Maybe you have more energy stored locally, right? For solar or micro grids? We don’t have as many power lines in rural areas. STEPHEN PYNE: Yeah. All that would be– I’m not a power line guy or grid guy, but there may be some places where you want to bury lines where winds are going to potentially carry fires right through communities. If you distribute– have a better distributed system, you could shut it off in one place and take it in another– and local storage, you can afford to turn off those big lines or redirect them in some way and then still have power. STEPHEN PYNE: Now the option is either you turn it off or you risk a fire. IRA FLATOW: Sascha, you’re a grid person, tell us about that. SASCHA VON MEIER: No, I do think that that strategically in the long-run is an important piece of the solution, and it’s also something we’re working on at Berkeley, for example, in our Eco-Block project to make communities more resilient in a way that makes it easier for the utility also to make that tough call whether to shut power off preemptively or to ride through other kinds of extreme events. And it’s getting to be more common for commercial and industrial customers to have uninterrupted power supplies, to have some backup. I think it’s important also to look toward the residential sector, including most vulnerable customers. And perhaps by aggregating customers at the scale of, say, a city block, and combine local solar generation, storage, and you can combine that with efficiency, electric vehicle charging, and so forth, we can really bring communities to a point where they can ride through these kinds of disturbances. IRA FLATOW: I’m Ira Flatow, this is Science Friday from WNYC Studios. Talking about fire prevention– the California wildfires with Stephen Pyne and Sascha von Meier. Sascha, are you optimistic about any of these things happening? Fire prevention or any of these techniques you’re talking about? SASCHA VON MEIER: I’m optimistic in the sense that I know these solutions can work. What’s tough is that they will take time and money. And I think ultimately, as Stephen has also said, this is a decision-making problem, because we really have to spend money today that– those are very certain costs– to reduce a very uncertain risk in the future. We expect that there will be more fires but we don’t know exactly where, right? And so if we’re successful, we’ll never know exactly what catastrophe we’ve averted, which in a sense mirrors this larger problem of climate mitigation. IRA FLATOW: Stephen, we always look toward the insurance companies or money incentives to get people to do anything, or head in the direction we want them to go. Is that a case here with the fire prevention, especially where your homes are concerned? IRA FLATOW: Well wait a minute. STEPHEN PYNE: That’s right. Well because there were losses elsewhere. And so we were going to be penalized personally for having done it, so we just went to another company. So that experience on a small scale suggests to me that that’s not going– the market is not going to fix this problem. It has to be given very strict parameters and then it can operate. IRA FLATOW: So what– so what kind of political bravery? What would be the first step if you’re a brave politician to do? Any suggestion? STEPHEN PYNE: Oh, I don’t know. I would say– sort of what I suggested before, is to make sure that you focus on the fire problem. And in the past, I mean, California has had these big fires for at least a century, and they always have commissions afterwards and they always make reports, and the reports look at all the different things. But the only thing that ever gets funded is the immediate protective capabilities. More engines, more air tankers, more crews, better alarms. And because that’s a clear political payoff, you’re seen to be doing something, the optics are good, but the longer, tougher questions that really involve how we live on the land, how people relate to one another, all of those kinds of things, which fire is integrating, get dismissed. And for this time, we need to really dig in our heels and say, it’s going to be a long process, but we’re starting to turn the crank in the right direction. SASCHA VON MEIER: And I think the same is true for the electric grid where the brave decision is to make the investments today that are long-term investments to then talk about how do we share those costs, but to admit that you get what you pay for, and we have to spend the money today. IRA FLATOW: All right. That’s a good place to end. Sascha von Meier is Director of Electric Grid Research at the California Institute for Energy and Environment at UC Berkeley. Stephen Pyne, fire historian, Professor in the School of Life Sciences at Arizona State University, author of Between Two Fires. Thank you both for taking time to be with us today. We’re going to take a break. When we come back, we want you to get involved in a flu project. We’re tracking the state of your health this flu season. Stay away us, we’ll be right back. Brew-masters pore over the chemistry and craft of making a good cup of joe. In his book 'How to Walk on Water and Climb Up Walls,' David Hu explores the wonders of the animal world.